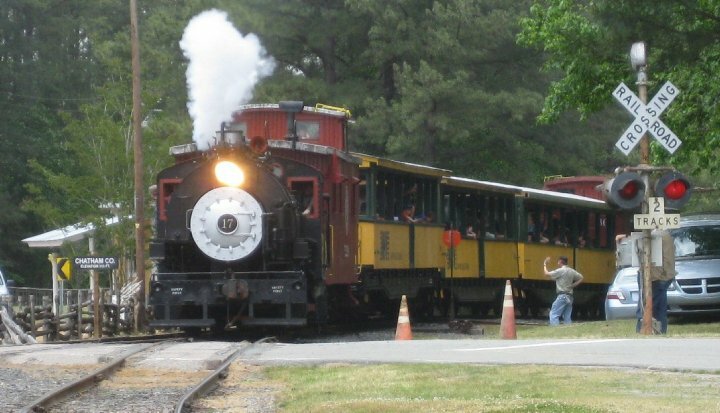 The New Hope Valley Railway is an all-volunteer excursion railroad. The East Carolina Chapter of the National Railway Historical Society acquired slightly over four miles of track and right of way from Bonsal to New Hill in 1982. Two years later, the first public ride was offered, and they have been operating ever since. The pride of the New Hope Valley Railway is Steam Engine No. 17. No. 17 is a 0-4-0 oil burning locomotive that was built in 1941 by the Vulcan Iron Works. 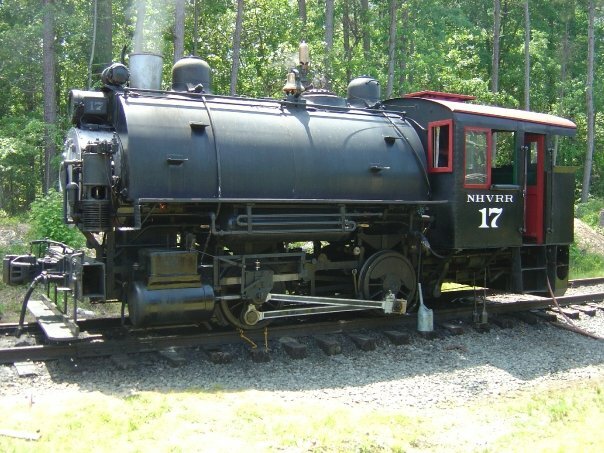 In 1999, the New Hope Valley Railway and the North Carolina Railroad Museum purchased the steam locomotive. After three years of restoration and repair, No. 17 was back to full power and has been a treasure to the New Hope Valley Railway and to visitors ever since. 17’s crew consists of a number of dedicated individuals that spend numerous hours working under extreme conditions. The crew’s dedication and perserverence has paid off as Engine No. 17 will participate in the 2010 West Virginia Rails Festival in Petersburg, WV – June 25-27. The NHVR’s Bonsal yard is more than just a home for their various cars and locomotives. It is home to the North Carolina Railway Museum, and one of the features of the museum is a totally restored 1922 Bethlehem Steel Railway Post Office and Baggage Car. The inside of the RPO car is in amazing condition and you can instantly imagine what is was like to work handling the mail inside the car. The New Hope Valley runs on the first Sunday of every month from May through November. They also run specialty excursions for Halloween and Christmas. The NHVR begins operating trains at 11 am. They alternate between their diesel engines and No. 17 throughout the day with the final train running at 4 pm. Costs are $10 for adults and $7 for children ages 2 through 12. On Sunday, May 2nd, I had the pleasure to take photos of the New Hope Valley Railway’s Opening Day. I arrived to their Bonsal rail yard early – around 9 am – and was able to walk the grounds and explore the trains. I took a ride out on the 11:00 AM diesel. It was amazing to see how the Bonsal yard changed from the time I arrived at 9 am to when the first train left at 11. A typical sleepy North Carolina Sunday morning slowly transformed to an active family playground where kids of all ages were sharing a great experience. The excitement of children when they hear the first train whistle is contagious and spreads throughout the New Hope Valley’s three passenger cars. Soon, two familiar words are spoken, “All Aboard!” And the first passenger ride of the NHVR’s season is underway. We travel four miles to the end of the track in New Hill. There, the train stops as the diesel locomotive needs reverse back so it can pull the passenger cars back to Bonsal. As the engine passes by, the operators and a few passengers wave hello to all. After the engine has been hooked back to the cars, the conductor walks by making a final inspection. The most popular man on the train smiles and waves to all as he walks by. When we return back to Bonsal, the excitement gathers again. Patrons eagerly waiting for the next run wave hello to all that are returning from their pleasant one hour ride through the woods. As I exit the train, the attention is focused on the switching of locomotives. The diesel engine that led us to New Hill and back is being replaced by the steam workhorse, engine no. 17. The focus to detail of both the yard crew and 17’s crew is precise. No. 17 is now successfully hooked onto the passenger train and is ready to make its first run down the line for 2010. I head back to my truck and head over to Horton Road. The New Hope Valley crosses this quiet rural residential road and is a great vantage point to catch any of the trains in motion. Off in the distance, I begin to hear the long loud whistle of No. 17. I hear it again, this time closer. Soon, I can not only hear the train but feel the vibrations of its approach. To my left and out of the woods appears No. 17. As the train passes, the passengers waive hello and some even took pictures of myself. Photographing the photographer…not a bad idea. I take one more trip back to Bonsal to catch No. 17’s return to the yard. I set up in the same place that I did two years ago where by chance my friend and I came across No. 17 for the first time. The feeling is the same though slightly different. Passengers waiting to board the 1:30 diesel run now share the excitement of hearing the distant whistle, the slow building roar, and the vibrations of the approaching train. I take one last set of photos before heading home. 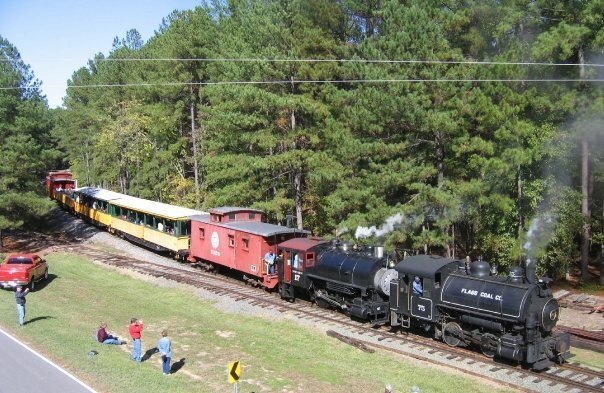 The New Hope Valley Railway is a treasure of not only the Triangle but North Carolina as well. The treasure comes from the experiences on the rail yard, the train ride, and those around you. But the real treasure comes from the numerous volunteers that spend countless hours on something they thoroughly enjoy. Visit The New Hope Valley Railroad’s website at http://www.nhvry.org! Holiday Express at Pullen Park in Raleigh! All aboard! Come join the Crabtree Rotary and Raleigh Parks and Recreation Department as Pullen Park will be festively decorated with thousands of lights and transformed into a winter wonderland! Children and adults alike will enjoy this holiday experience as they take the ride of a life time aboard the Santa Express Train! Experience an unforgettable adventure through acres of pure holiday magic where thousands of lights dazzle your senses and then stop off at Santa’s Village where you’ll meet Santa himself! The evening will also feature concessions, carousel rides, holiday entertainment and more! Online Visit RecLink by clicking here. Mail or Fax Downlaod ticket order form by clicking here. All Event parking is located off Western Boulevard at the Dorthea Dix Soccer fields on Hunt Drive. Both parking and shuttle services are free to the public and will be available daily from 4:00 pm-9:30 pm. Shuttles will also be able to accommodate ADA and stroller needs. For more info on the event or for information on becoming a sponsor of the Holiday Express, CLICK HERE or contact the Pullen Park Ticket Office at 919-831-6468.